In the collective imagination the Kingdom of God equals eternity with lots of clouds and angels. In the paintings of Marcelo Bittencourt that is different. In his portrayal of the Kingdom there is a mixture of earthly and heavenly elements and sensations. In order to see the Kingdom of Heaven it is not necessary to die. It is possible to experience some of the grace and beauty given by God right now, alone or in community, which can make us realize that life is much more than the commercials promise us. Bittencourt has the custom of painting during events like services, shows, sermons and weddings. 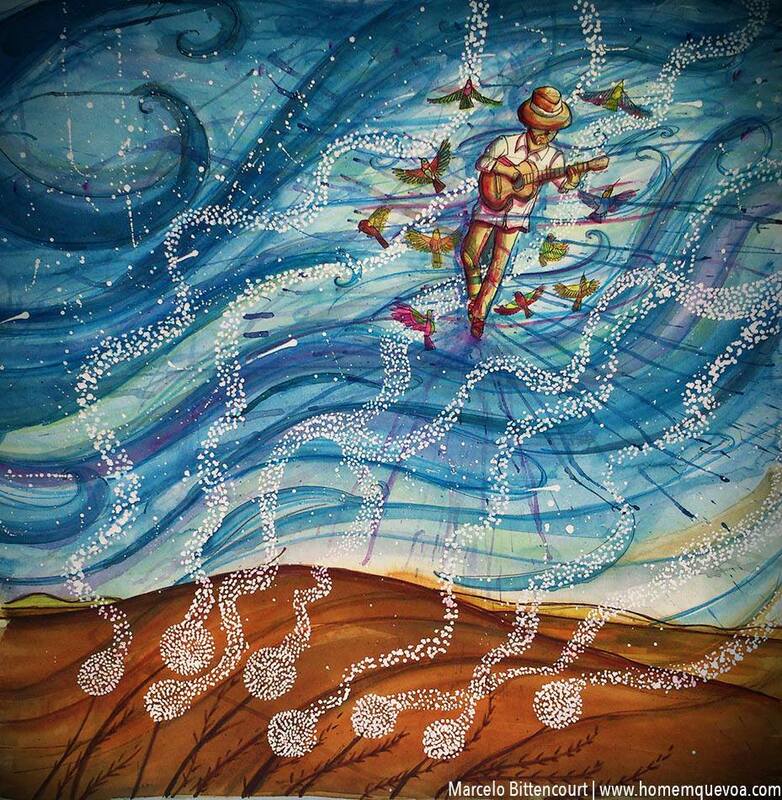 The result are graphical prints of the life experiences provided by music or poetry – or by the Kingdom of God. For this reason wings, astronauts or other flying creatures are present in many of his paintings. We can learn more about the Kingdom of Heaven by opening ourselves to the arts. Spiritual life is not just about the Bible and religious themes. Who has never experienced the heavens while watching a movie? Or never noticed the body regenerate to the sound of John Coltrane? After all, “Those who hope in the Lord will renew their strength. They will soar on wings like eagles; they will run and not grow weary, they will walk and not be faint” (Isaiah 40:31). Bittencourt’s wings, promised here by God, can be the result of reading good fiction or listening to great music. Let’s spread more of the Kingdom of God. Let’s make more music and pictures, write and donate more good books, distribute poetry, let’s sing the song of the enchanted Kingdom, as in all of these things we can praise the name of God. Marcelo Bittencourt: The Man Who Flies, 2014, acrylic, nanquim and gouache on cotton paper, 60 x 90 cm. Marcelo Bittencourt is a Brazilian visual artist, illustrator and graphic designer. Born in São Paulo, presently living in Curitiba, he has worked on several projects of graphic design and illustration since 2004. He teaches and guides children and adolescents in a social project, which includes a drawing class. He has studied Graphic Arts at the Universidade Tecnológica Federal do Paraná and currently devotes part of his time to studying painting, expressing his imagery in mixed techniques on paper and canvas, and on walls with acrylic paint, watercolour, ballpoint pens and spray paints. Since 2014 he has participated in several exhibitions in Brazil. He has done several presentations where he paints in loco, capturing the atmosphere of an event and environment and transforming it into a unique work of art. See more of his work at www.homemquevoa.com. Thiago Bragantin is Brazilian. He has a Bachelor of Philosophy from the Federal University of São Paulo (UNIFESP) and a Master of Divinity from the Theological Seminary Servant of Christ. He is one of the curators of https://www.culturaecompendium.com/.